Pourville is the seaside resort of the town of Hautot, located in a landscape of white cliffs crowned with green meadows that inspired Impressionist painters. At the seaside you can find a pebble beach lined by a pleasant pedestrian promenade. It is a charming destination for families looking for peace and authenticity. 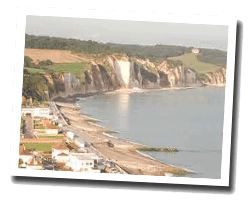 In Pourville enjoy a seaview holiday rental. 5 room apartment 80m2 in a landscaped park 2000 sq. m overlooking the sea. Terrace - garden. 3 Bedroom(s), 3 double bed(s). short stays possibility. Final cleaning : 30 €. independant Studio flat 30sq. m in a modern House with Terraces, beautiful sea view. very quiet area. outdoor furniture. This property is a 5-minute walk from the beach. This renovated villa from the 19th century is Located in a 2000 m² park and is 600 m from the sea. It includes 2 apartments with a sea view. Dieppe is 6.5 km away. La Villa Marguerite is a renovated villa from the 19th century is Located in a 2000 m² park and is located 600 metres from the sea. 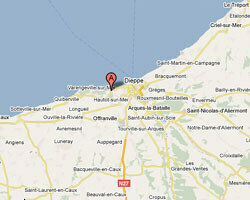 Dieppe is 6.5 km away . 3 Bedroom(s), 4 double bed(s). short stays possibility. 2 rooms apartment 36m2. parking in the courtyard. Charm and comfort: independent apartment in a seaside villa divided into two apartments. Shared park of 2000 m2. Terrace. Linen rental possible. Possibility to rent the 2 apartments for 12 persons. 3 Bedroom(s), 2 double bed(s). short stays possibility. Final cleaning : 35 €. Price from 589 € to 829 €. Located on the beachfront, Normandy is a self-catering accommodation located in Hautot-sur-Mer. You can relax on the furnished terrace and enjoy the sea view. Located in Pourville-sur-Mer, 10-minute drive from Dieppe, La Cabane des Mouettes is Located on the cliffside and offers panoramic views of the sea. The self-catering property offers a private terrace and garden. There is also an indoor swimming pool on site.